This bilingual psalter was made for use at Winchester Cathedral after 1121 and probably before 1161. Its Latin and French texts are written in parallel columns on vellum and decorated in ink, tempera colours and gold. The manuscript has long been associated with Henry of Blois, younger brother to King Stephen and Bishop of Winchester from 1129 to 1171. 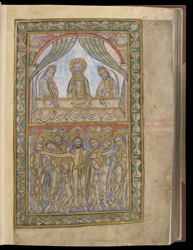 However, lavishly illustrated psalters such as this were usually made for female patrons, and it is not clear why Henry would have needed or wanted a bilingual copy of texts he would have known very well.